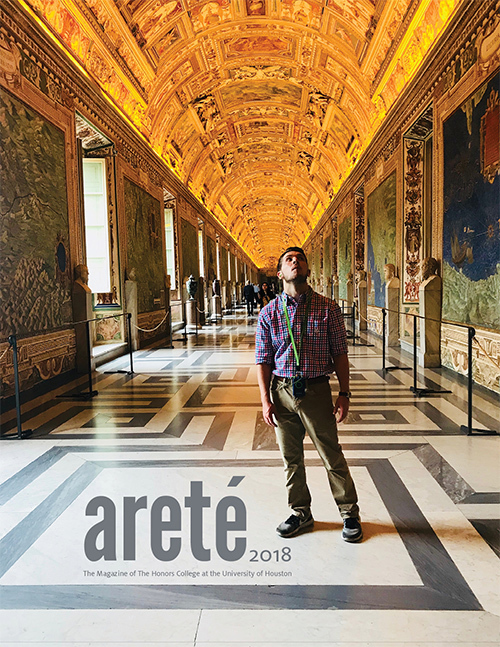 The Honors College is pleased to announce the release of its latest edition of areté, an annual alumni magazine. The publication looks back at 2018, celebrates faculty achievements, introduces new members to the team, and marks the 60th anniversary of honors education at the University of Houston. “The Honors College continues to demonstrate the lasting value of a rigorous, broad education, expanding experiential learning opportunities, rewarding academic excellence, and recruiting top-notch faculty and students from across the nation,” begins an introduction by William Monroe, dean of the Honors College. The issue goes on to feature program news and photos from 2018. One milestone is the success of the Office of Undergraduate Research. Through programs like SURF and PURS and an increased focus on nationally-competitive awards, the 2017-18 academic year gave rise to six Fulbright Scholars, four Critical Language scholars, and many other winners of major awards, travel scholarships, and funded research opportunities. The issue also highlights two outstanding alumni, John King (’92) and Serrae Reed (’18). King, who serves as president of the Honors College Advisory Board, was recently promoted to Americas vice chair for assurance at Ernst & Young, a position in which he leads 20,000 employees across the Americas. Reed is in her first year at Yale, where she is pursuing a doctorate in mechanical engineering and materials science, supported by the prestigious Ford Fellowship. The issue also showcases an active year in study abroad, documenting faculty-led expeditions to Egypt, Europe, the Galapagos Islands, Haiti, Israel, and Greece. Read the full issue online. Click on the cover image to view the 2018 areté magazine.